Great Tastes Tuesdays! : Tuesday Treats! It is Tuesday and this is the recipe for the week. This is easy and fun and everybody loves these. 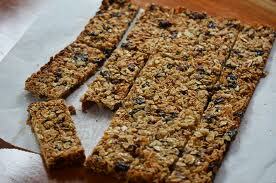 Granola bars that you buy at the store can sometimes seem airy and not very filling, but these definitely are. Stick these in yours or your children's lunch or even take them to a party. They are a great treat! Put your 8 cups of oatmeal on a cookie sheet and bake it for 15 minutes at 350 degrees. Stir them a little bit while they are browning. When the oatmeal is done browning and out of the oven melt the 1 bag of marshmallows, honey and butter on the stove. When that is all melted together add the peanut butter. Pour your mixture onto a greased cookie sheet or a wax paper on a cookie sheet while it is still warm and then add your chocolate chips or M&M's on top. Press these down into the warm granola bars so they will stay put with another cookie sheet. Happy New Year With Your Children! DIY: Nativity Set to Make Before Christmas! Sweet and Salty Pretzel Crunch!